Rosewood & Red Berries is a unique and unexpected pairing of juicy red berries with rosewood and oak; cassis bursts in and adds a tart kick. 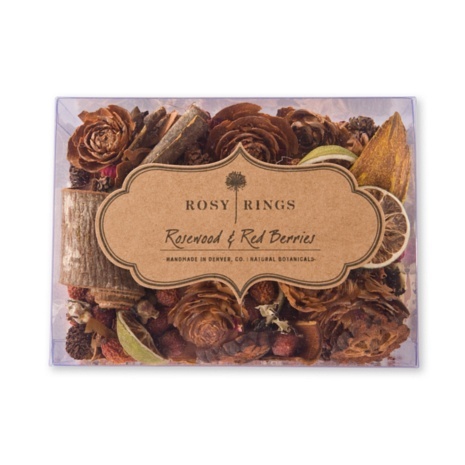 A joyous, happy fragrance appropriate for the holidays, or anytime you need a whiff of blissful, berry optimism. Made with: atta slices, birch cones, cascara bark, cedar roses, lichen moss, mahogany spoon, oranges, rosehips, roses, essential and high quality fragrance oils. 6 Ã‚Â¾Ã¢â‚¬Â� l x 5Ã¢â‚¬Â� w x 2 Ã‚Â¾Ã¢â‚¬Â� d. Approximately 6 cups.